Former American Idol contestant Julianne Manalo released an original single “Invincible”. 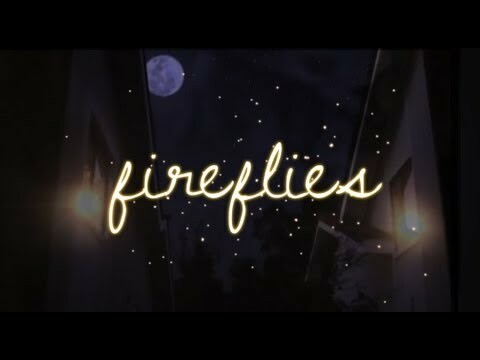 She was inspired to write this song after a close family member was diagnosed with cancer. This touching song is dedicated to all those who are battling cancer. Her personal experience speaks volume like her vocals. Also check out these videos about fighting cancer: The Fight by Rocky Sandoval, Touching Ourselves with Lisa Ling, Touch Your Boobies, Breast Cancer Awareness Month with Olivia Munn, Jay Sean helps Kick Breast Cancer, and Pink Glove Dance for Breast Cancer Awareness. This entry was posted in health, music on October 29, 2012 by Kevin Hsieh - channel APA. Janet Liang, a vibrant 25 year old UCLA graduate and a leukemia patient who spent years championing leukemia awareness and Asian American bone marrow registration, passed away last week. In Janet’s memory, this site is partnering with a network of other prominent Asian American sites to host 170 in 7: A Bone Marrow Cyberdrive in Memory of Janet Liang. The 170 in 7 campaign will be running from September 17, 2012 to September 24, 2012. 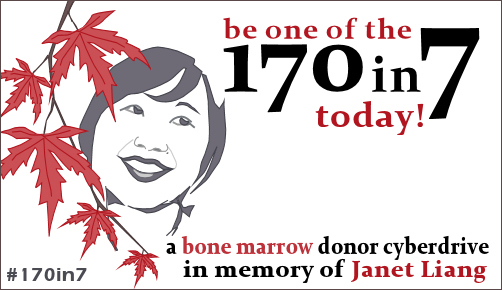 Our goal is to register 170 new potential bone marrow donors in 7 days in memory of Janet Liang. Leukemia is a type of blood cancer and the most common cancer to affect children and young teens. Treatment to save a leukemia patient’s life often requires a bone marrow transplant from a “perfect match” donor – a donor whose blood matches a recipient’s blood for 10 separate genetic markers. Unfortunately, Asian American and other non-White leukemia patients are much less likely to find a “perfect match” donor than White leukemia patients. This is because Asian Americans and other minorities are significantly underrepresented in Be The Match, the national bone marrow registry used to search for and match potential bone marrow donors with recipients. Janet made it her mission to register Asian American bone marrow donors, and thanks in part to her efforts, at least 18 bone marrow matches were made to recipients nationwide. However, last week, Janet passed away without finding a perfect match for herself. Today, many other Asian American leukemia patients are still waiting to find their perfect match, like 2-year-old Jeremy who was recently diagnosed with leukemia. To celebrate Janet’s life and her legacy, we want to register 170 new potential bone marrow donors in Janet’s name in just 7 days. If you don’t have a Twitter account, send an email to jenn [at] reappropriate [dot] co to be counted! In about one month, a cheek swab kit will be sent to you in the mail, along with instructions and a pre-paid return envelope. Follow the instructions to swab your cheeks and return the kit. If you are matched (only 1 in 540 registered donors are ever matched), you will then be contacted and asked if you would like to donate your bone marrow. Registering is not a commitment that you must donate; it is only to help match recipients with potential donors. Most donors are never matched. But if you are matched and if you do choose to donate your bone marrow, that donation is likely to save a young person’s life. Donor registration is free for the donor because AADP and other non-profit organizations cover the costs of donor registration through charitable donations. If you are unable to register as a bone marrow donor, please donate to AADP to help fund registration costs for other donors here, or to the Liang family (PayPal account using helpingjanet@gmail.com as the recipient, or checks payable to “Janet Liang” sent to PO box 1526, Pleasanton CA 94566). If you are already registered, please help spread the word about the 170 in 7 bone marrow cyberdrive through Twitter and Facebook. If you would like to join your site to this partnership or if you would like more information about the 170 in 7 bone marrow cyberdrive, please contact Jenn. 170 in 7 is a partnership between the following: channelAPA, 8Asians, AARisings, Angry Asian Man, Asia Pacific Arts, Asian American Donor Program (AADP), Jeff Yang (columnist, Wall Street Journal Online), Reappropriate, Rice Daddies, Schema Magazine, and a special partnership with Team Janet and Jeremy Needs You. If you would like to join the 170 in 7 campaign, we would love to add more partners to this week-long bone marrow donor cyberdrive. To join, please contact Jenn for more information. This entry was posted in health on September 17, 2012 by Kevin Hsieh - channel APA. channelAPA.com just received the sad news of Janet Liang’s passing. Over the past year, we’ve written about all the support for her as well as bone marrow donation awareness among the Asian American community (Asian Americans Helping Janet Liang and White Frog cast PSA from Janet Liang). We even had a chance to meet her in person at a YTF concert in the San Francisco Bay Area. (At that time, Janet was still high in spirit. She and her friend were definitely hustling to get people to be signed up to the Marrow Donor Registry. You can still help future people in need of bone marrow donation by joining the registry.) But nothing was more emotional than Janet Liang’s personal plea to find the perfect match for a bone marrow donor. The heart-wrenching video went viral helping her and her desire to find a donor. As more people shared the video, it eventually reached Jeremy Lin. During the height of Linsanity, Jeremy Lin even tweeted out this message of support for her on channelAPA.com featuring her personal plea. We ask that you provide her family with privacy and respect during this difficult time. Thank you to all of Janet’s supporters. Your outpouring of love and support has always been a constant source of strength for her. Please help to honor her legacy by continuing the fight for leukemia awareness in her memory. Join a marrow registry in the United States, Canada, China, Taiwan, Hong Kong, Singapore or other countries. This entry was posted in health on September 12, 2012 by Kevin Hsieh - channel APA. Using her reporting skills, Lisa Ling plays Maria Lowenstein in the comedic short “Touching Ourselves.” She reports on the the movement of people fondling themselves in public. Footage of self examination of lumps in breasts and testicles were caught on tape as people from all walks of life freely check themselves. It’s cancer checking mayhem everywhere along with some hands on learning. Time to F*ck Cancer and detect it early. 90% of cancers are curable if caught in stage one, why the hell aren’t you looking for them?! Just check your privates in private to be sure you’re lump-free. Watch more videos on cancer detection: Touch Your Boobies, Breast Cancer Awareness Month with Olivia Munn, Jay Sean helps Kick Breast Cancer, and Pink Glove Dance for Breast Cancer Awareness. This entry was posted in comedy, health, shorts on August 20, 2012 by Kevin Hsieh - channel APA. Watch more thought provoking commercials from Asia: Silence of Love : Thai Life Insurance Commercial, Bowl for Humanity, Put A Smile On Your Parents Face This Chinese New Year, and Dream Rangers. Also see What happened to the Indonesian smoking baby? This entry was posted in commercial, health, kids on June 22, 2012 by Kevin Hsieh - channel APA.